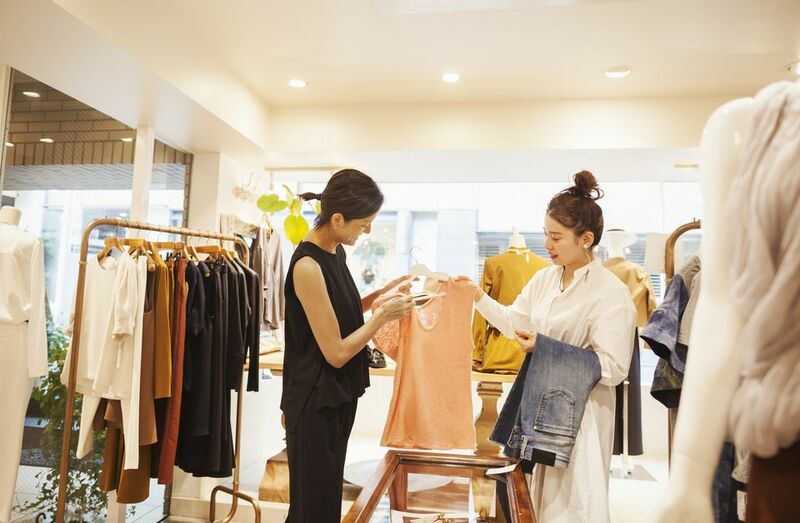 When you're shopping during your overseas travel, make sure you know how to properly convert your United States clothing size to that of international retailers. Sizing can vary greatly from country to country—while a woman may be a size 6 in America, for instance, she'll need to shop for size 6/8 in the United Kingdom or size 40 in Italy. Clothing and shoe size conversion charts give you an idea of the right size to buy or try when visiting London, for example, but you should keep in mind that sizes can vary in different stores, so a size 6/8 might not fit quite right even if that's your converted dress size. Treat size conversion charts as guidelines rather than hard-set rules and always try on clothing before you buy it to ensure the proper fit. For women shopping abroad, it's easy to get confused or frustrated with the United Kingdom's sizing chart—everything is about a size or two bigger than in the United States. A woman who fits in a size 12 in the U.S., for instance, will need to look for size 14 in England. You'll notice that France, Spain, Portugal, Germany, Scandinavia, and Italy all use sizing based off of waist measurements rather than a number system that starts at size 0 and works its way up by twos. To confuse things, France's sizing is different from Italy's despite using the same type of measurement metric. To make matters more confusing for female shoppers abroad, the United Kingdom's shoe sizing runs smaller than America's—women who wear a size 7 in the U.S. would wear a size 5 in the U.K. The United Kingdom and the United States are also the only two countries in the world that label their shoe sizes with smaller numbers while the rest of the world uses either the metric system to indicate the actual length of a shoe in centimeters or a system known as the Paris point, which equates to two-thirds of a centimeter. The British and American sizing system is derived from a "barleycorn measurement," an old English unit that approximately equals one-third of an inch, where the largest shoe size is taken (a size 12 is 12 inches long) and every size smaller than it is smaller by one barleycorn, not like you might guess, an inch. Shopping internationally for men's clothing is a little simpler than women's, but comes with its own unique set of challenges, mostly due to having a general sizing label of a small, medium, large, and extra large. Because so many numbered sizes are included in each worded sizing comparison, some clothes may fit better than others. As a man shopping abroad, you'll definitely need to try on shirts to make sure they fit. Fortunately, though, if you happen to find a nice suit jacket in London, the sizing is identical to that of the United States, so if you know that you're a size 32 in America, you can easily pick up the same size in England and figure it should fit. The sizing of men's pants and trousers is universally determined by the physical measurements of their waistlines, and both the United States and the United Kingdom use inches to size these garments. However, the rest of Europe and Asia measure their men's pants in centimeters, which may be a difficult conversion for Americans shopping elsewhere in the E.U. A helpful trick for converting inches to centimeters without a chart is to figure that every inch is equal to approximately 2.54 centimeters. Men's shoe size conversions are even more confusing than those of women's shoes—shoes in the United Kingdom are a half-size smaller than the United States and there are random half-sizes in other European and Asian sizing charts. Like women's shoes, though, these measurements are based on a variety of factors dependant on where the shoes are being constructed and sold. Some sizes measure the length of the interior of the shoe while others use measurement systems to determine size. Still, most shoes, especially sports shoes, are sold on international markets and feature multiple countries' size details on the tongue of the shoe—you'll often find at least the United Kingdom's, United States', and Japan's sizes on a small tag on the inside of each shoe. Children's clothing sizes vary greatly by country, though Europe has the most accurate description for sizing of any of them, using measurement in centimeters rather than age to denote each size. The United Kingdom, Australia, and the United States, on the other hand, use the age children will most likely fit into the clothing to describe the size of that garment. Unfortunately, the U.K, Australia, and America have slightly different ideas of what size children are, so the conversion chart is highly beneficial when traveling between any of these countries. Pay close attention when shopping for your young relative or child, especially if they aren't with you to try on the clothing, as sizes are slightly different everywhere. Children's shoe size conversions are perhaps the most difficult on this list—at least in terms of knowing them without using this chart. Again, U.S. and U.K. sizes are off from one another by a half-size and Europe and Japan use an entirely different system altogether to measure their shoe sizes. You should also keep in mind that if you have older children who are almost fully grown (or at least reaching adult size) that children's shoe sizes only go up to 13 and a half before entering adult shoe sizing of 1 to 2.